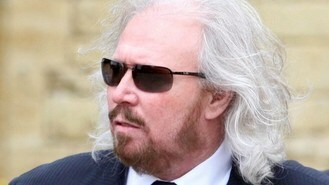 The last surviving Bee Gee, Barry Gibb, has described his emotions on going back on the road without his brothers Robin and Maurice by his side. Robin died last May, and Maurice in 2003. The 66-year-old singer/songwriter, who played in Australia earlier this year and will entertain audiences in Britain and Ireland in the autumn, told The Sun: "On stage is hard. One minute you feel they're right with you, the next you know you've got to pull something off yourself. "The audiences have been incredible, they've been so supportive. They're finding closure as well." Gibb said his wife Linda had told him to stop moping around the house. "She told me to get off my backside and stop going along with the whole idea that everything was finished for me. "She said, 'You've got music, so make music!' That was her kicking me, so I decided to jump right in." The absence of his brothers is eased by having his eldest son Stephen on guitar, and Maurice's daughter Sam singing with him. He said: "We created this show that really celebrates everything we ever did, or as much as we could put in to a show. I feel good. I felt a lot worse last year with all the stress over Robin. "Personally, I think Robin knew he was dying. I knew he was ill for a long time, it wasn't just the last couple of years. It's a hard reality, but we will all see it at some stage. That's the lesson, it's not unique to any person." Robbie Williams stars in Dizzee Rascal's new video, with the pair riding souped-up mobility scooters. Veteran electronic duo Daft Punk have scored their first-ever UK number one single with much-awaited funky comeback track Get Lucky. The Wanted's Siva Kaneswaran has admitted that he is worried that his bandmate Nathan Sykes may not sing again. Emeli Sande is celebrating after her debut album Our Version Of Events toppled the Beatles' record of spending the most consecutive weeks in the UK top 10. One Direction could be making their fans' dreams come true as their third album could be out in time for Christmas. Selena Gomez and Justin Bieber took home top honours at the 2013 Radio Disney Music Awards. Beyonce's photo ban on her Mrs Carter Show tour has backfired as fans flooded Twitter with their own snaps. Prince is on the look out for small venues to play a string of intimate gigs in the UK.